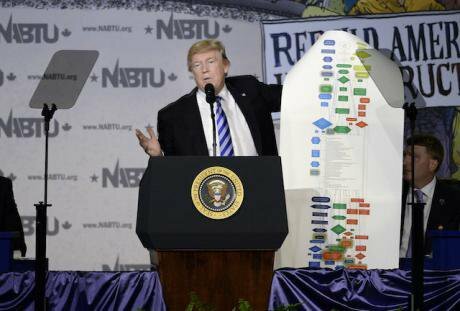 Trump holding up a chart of regulation at a CEO town hall on the American business climate, April, 2017. Olivier Douliery/ Press Association. All rights reserved. As we enter the uncertain Trump era with respect to trade policies, one can only guess that big trade players will come back to the multilateral fora, such as the World Trade Organization (WTO), as a reliable vehicle to foster their global trade agenda, especially as the free trade agreement (FTA) model fell apart after President Trump took office. Since the Trans-pacific Partnership (TPP) is dead, Transatlantic Trade and Investment Partnership (TTIP) and Trade in Services Agreement (TISA) are on hold, a return to the multilateral WTO offers the best chance of progress on e-commerce rules. E-commerce will be one of the key issues at this year’s WTO's Ministerial Conference in Argentina, December 2017 (MC11). The Minister of Foreign Affairs of Argentina – host nation of the MC11 in December and G20 meeting in 2018 – has described e-commerce as “an essential part of the future of global trade, to bridge the inequality gap, improve gender equality” and “leapfrog into the twenty first century”. He has urged member states to renew their commitment and mandate to work on e-commerce. In fact, the US and other major developed countries have been promoting the e-commerce agenda since July 2016, by effectively dictating the terms and asking WTO members to remove any so-called regulatory barriers in the global e-commerce market. Along with some developing countries, they are determined to secure a mandate on e-commerce in Argentina despite opposition from many, including African countries and India. ( See the latest discussion in Euro-DIG here). If they succeed in Buenos Aires, the WTO’s 164 members will negotiate a new agreement on e-commerce. One must wonder whether this will be an opportunity to foster digital rights or leave us with even lower standards and a concentrated, quasi-monopolistic market benefiting from public infrastructure? The rhetoric of opportunities for the excluded – connecting the next billion – sounds great, but only if we disconnect it from the current realities of the global economy, where trade deals push for deregulation, for lower standards of protection for the data and privacy of citizens, where aggressive copyright enforcement risks the security of devices, and when distributing the benefits, where big monopolies, tech giants (so called GAFA) based mostly in the US, to put it bluntly, take them all. So far, developing countries and civil society actors, while opposing this negotiation, don't have their own digital agenda sorted out. E-commerce markets in developing countries are unprepared, lagging behind in terms of competitiveness and skill. Trade policy-makers in those countries are not yet sufficiently informed on highly technical digital issues. Civil society organizations (CSOs) and digital right activists are unprepared to meet the challenges of a highly technical trade negotiations on e-commerce, with nuances directly affecting the way digital rights and safeguards are deployed. The WTO e-commerce agenda is inevitably complex: it includes far-reaching provisions on the cross-border delivery of services affecting privacy, data protection, consumer protection, cybersecurity and net neutrality, and new Internet-related IP rights in a digital context. These raise significant concerns for the Internet, its global infrastructure, and the right of governments to develop policies and laws that best preserve the free and open internet. There are many unknowns regarding the technological advances ahead, and therefore the digital economy. Given the uncertainty in the policy landscape, devising rules at the WTO that place binding commercial protections above digital rights and public interests could be devastating for global internet law and policy, leaving the developing countries with eroded rights and limited freedoms. Never before has a trade negotiation had such a limited number of beneficiaries. Make no mistake, what will be discussed there, with the South arriving unprepared, will affect each and every space, from government to health, from development to innovation going well beyond just trade. Data is the new oil – and we need to start organising ourselves for the fourth industrial revolution. The data lords, those who have the computational power to develop superior products and services from machine learning and artificial intelligence, want to make sure that no domestic regulation, no competition laws, privacy or consumer protection would interfere with their plans. Disguised as support for access and affordability, they want everyone to connect as fast as they can. Pretending to offer opportunities to grow, they want to deploy and concentrate their platforms, systems and content everywhere in the world. Enforcement measures will be coded in technology, borders for data extraction will be blurred, the ability to regulate and protect the data of citizens will be disputed by supranational courts, as local industries cannot compete and local jobs soar. If we are not vigilant, we will rapidly consolidate this digital colonisation, a neo-feudal regime where all the rules are dictated by the technology giants, to be obeyed by the rest of us.